I'm still a bit tentative about the whole idea of embarking on what to me seems a rather daunting journey of Bonsai artform. I'm not a very minutia-oriented person and tend to resist the idea of conformity. Nevertheless, I have a couple of possible starter subjects, so I thought I'd post them for general inspection and get your impressions. They're all basically for practice to get the idea of how to take care of containerized woody plants/trees. They were pretty much brutally chopped and dug up without any real foresight as to what they might become or how they might look later. I'd like to get some advice on what I should be doing with these two potted ones as well. Anything I should do now before they come out of dormancy? Later on this season? Here's a Rose of Sharon growing too close to the foundation. I just cut the roots in a big circle with my gardening Chef's knife. Should I dig it up in the next couple of weeks or should I trench around it and leave to grow side roots? (Rose of Sharon is practically indestructable though). Also should I cut down in a diagonal to cut off its roots growing down below? Now would be a good time to get them into a shallow but broad container with a proper free draining bonsai mix. Many things can be used for this from cut down nursery containers to purpose built wooden boxes. The shallow container begins the transition process to an eventual bonsai pot. By using a coarse, well drained and aerated medium you encourage numerous feeder roots. The Elm, for example has it's roots arranged fairly well but they are too long with no fine roots close to the trunk. This is something you need to encourage, a network of feeder roots close to the trunk. You are probably only going to use one branch on the Elm for the next section of trunk. Possibly the one that appears to be older, the one to the back. For now though I would leave the growth and prune nothing. The top growth will help fuel the development of the new roots you are hoping for. Have you taken a look at the two relevant threads in the Bonsai Library? For background information I highly recommend Brent Walston's site. He is a well known bonsai nurseryman who writes in a very straight forward manner. Read all of the article then re-read them. A few could be skipped over such as the ones about Pines but the general ones are all worthwhile. Here's another site that we frequently suggest. It would also be a good idea to look into any local bonsai clubs in your area. I think Len (djlen) is a member of a club in NJ and he may be able to provide you with some details. I know this barely scratches the surface but knowledge will come with time. We'll be glad to help as best we can as the need arises. That's what I'm afraid of FLBonsai, I *am* prone to obsessive enthusiasm, in case anyone hasn't noticed. Gnome, thanks for the tips. I noticed an auto-parts store the other day that I'm pretty sure is the right one for those chunky DE. The other NAPA "store" closer to my house turned out to be just a gas station so I don't know if they'll have it. I may change my mind but for now, I'm leaning towards some organic content so I have been thinking screened chunky DE and small bark mulch mixture of some kind... I'm thinking I might start a bark/wood chip compost for the purpose. I'll repot the currently potted trees. I think I have appropriately sized azalea pots. They were temporarily potted in medium~med/small chunk rubble of compost (composted sticks and unfinished stuff) and decayed tree stump, combined with 3/8" pea gravel, after screening out with 1x2 wire fence, then screening with 1/2" for potting soil mix. But I'll get a proper bonsai-type soil mix together for the new repot. 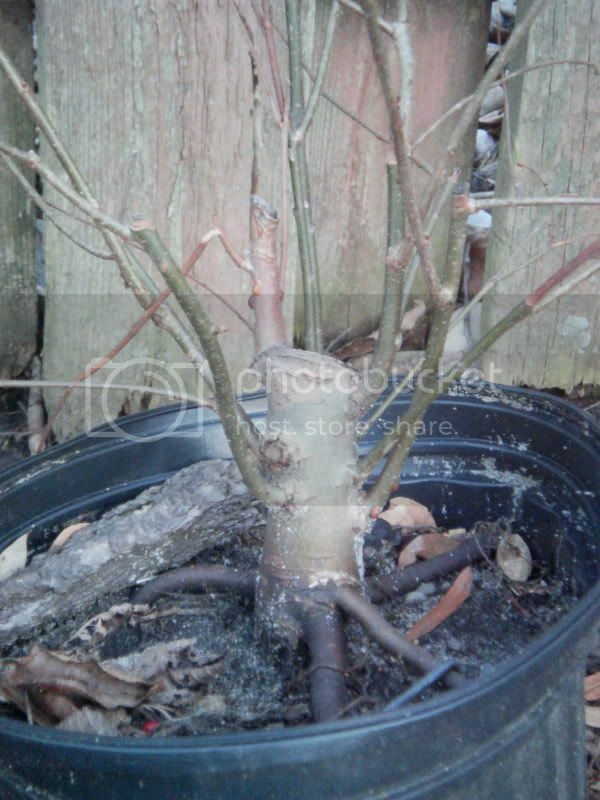 For the Rose of Sharon in the ground, should I cut off its tap roots (meaning the roots below the shrub)? I only cut straight down in a circle. Should I do the cut off, up-root and "tile" thing and then put it back in the ground? I could do that too. Rose of Sharon is the last woody anything to come out of dormancy in my garden (plus it's growing in the NNE shadow of the house -- part of the reason it's so fat... it only has chance to grow a few flowers so most of its efforts have gone into growing foliage and trunk.) so I think I have time to let it recover a little from this first root pruning before doing something else in early~mid April. Oh! 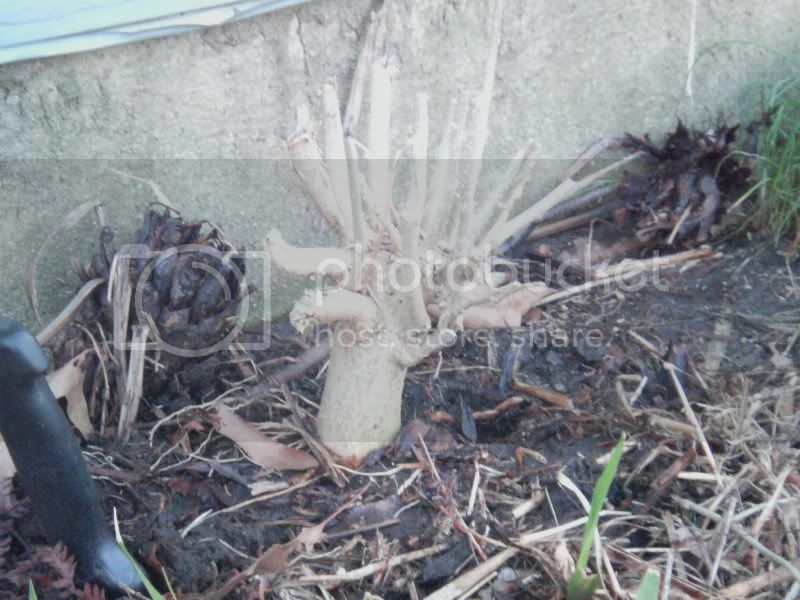 One more thing -- I love the radiating symmetry of the roots in first photo. Is the difference between the two due to naturally developed -- as in rooted cutting or a seedling vs. pruned off thick roots? Gnome, thanks for the tips. I noticed an auto-parts store the other day that I'm pretty sure is the right one for those chunky DE. I'm leaning towards some organic content so I have been thinking screened chunky DE and small bark mulch mixture of some kind... I'm thinking I might start a bark/wood chip compost for the purpose. Don't confuse soil-less with inorganic. The majority of my pots, although soil-less, contain an organic component, which for me is aged Pine bark. Look for a product such as soil conditioner as it is already partially composted. If you can't find such, get a big bag of Pine bark nuggets. This material is almost always too big but you can usually find some smaller particle in the bag or you can break it up without too much trouble especially if you only need a little. Whatever you don't use can go into your special bonsai compost pile for next year. Remember consistent particle size is what we strive for. The best draining mix is one that is composed of similarly sized particles throughout. The concept of a drainage layer is largely discredited. Similarly, it is important to remove the native soil form the plants or you will have two zones in the pot, one more water retentive than the other. You can also use Perlite if you can find some that is not too fine. Many growers don't like the looks of this and some will float at the first few times you water but for plants in development I don't mind the obvious white particles. Lava Rock is another excellent component but you probably won't find it in an appropriate size unless you go mail order. Our member Tom (Tachigi) offers this material, and others, if that's the route you want to take and you have the time to acquire it. 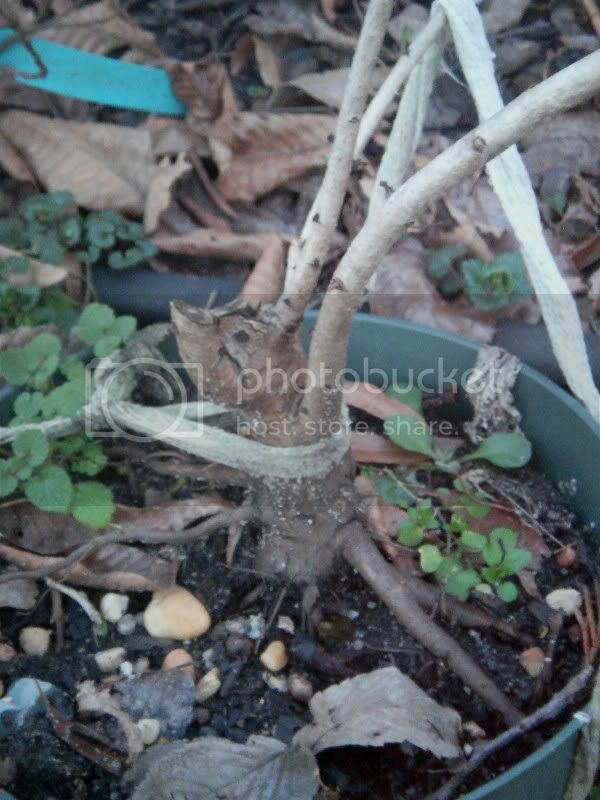 For the Rose of Sharon in the ground, should I cut off its tap roots (meaning the roots below the shrub)? I only cut straight down in a circle. Should I do the cut off, up-root and "tile" thing and then put it back in the ground? I could do that too. My practice is to dig the plant. wash the roots with a garden hose and then prune. This gets all of the garden soil or clay particles out allowing you to get a better look at the root structure. It is also easier on your tools. 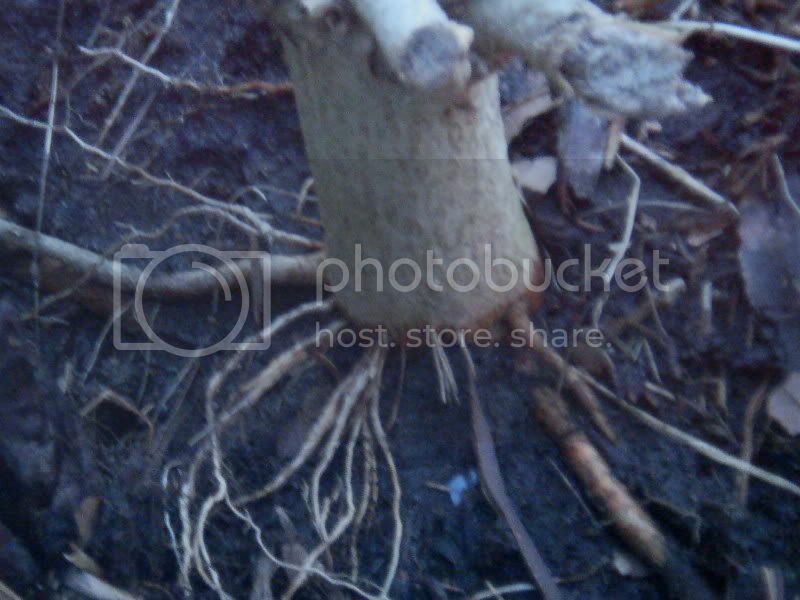 Yes, prune the tap root back. Use your judgment to determine where to cut. If there are a lot of roots near the surface you can be more aggressive and still expect a good outcome. It could go back into the ground, a lot depends on your goal. We often suggest field growing to thicken young stock but your material all seems to have some girth. Besides, if you wanted thicker trunks you would have let them grow more before the first chop. Since you chopped them I assume you are ready to start refinement. Of course you can prune it and put it back into the ground on a tile. There's more than one way to approach this. They are both seedlings but of differing ages and species; the top plant is younger. The bottom one may not have been worked on early, or aggressively, enough so I had to go backwards a bit. 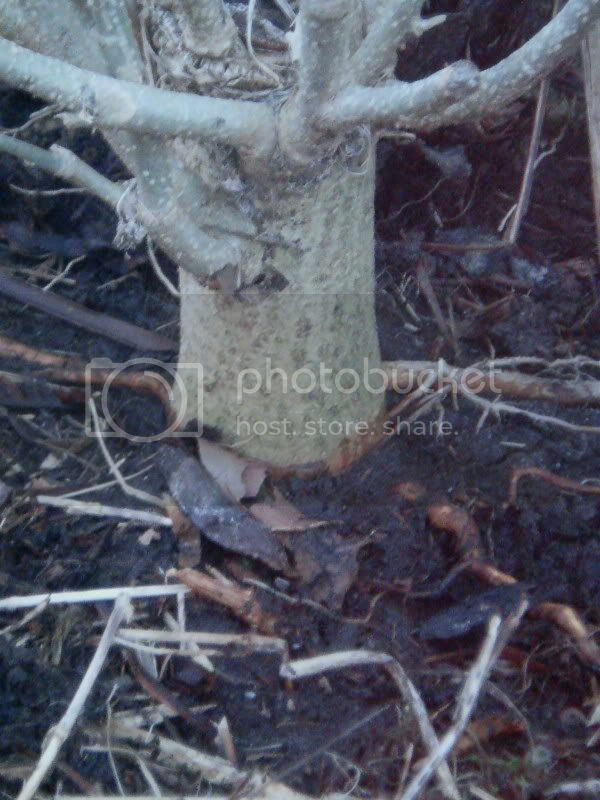 Actually you want a little 'thick root' close to the trunk as this will later become the exposed nebari.